The Geo-political news caught up to the stock market this week. There’s just way too many issues out there, so the rather positive economic news got swamped. Will ISIS storm Northern Iraq? Will Russia invade Ukraine? Will the Gaza peace talks start? This market doesn’t know the answer and usually doesn’t like uncertainty, plus many folks are on vacation. 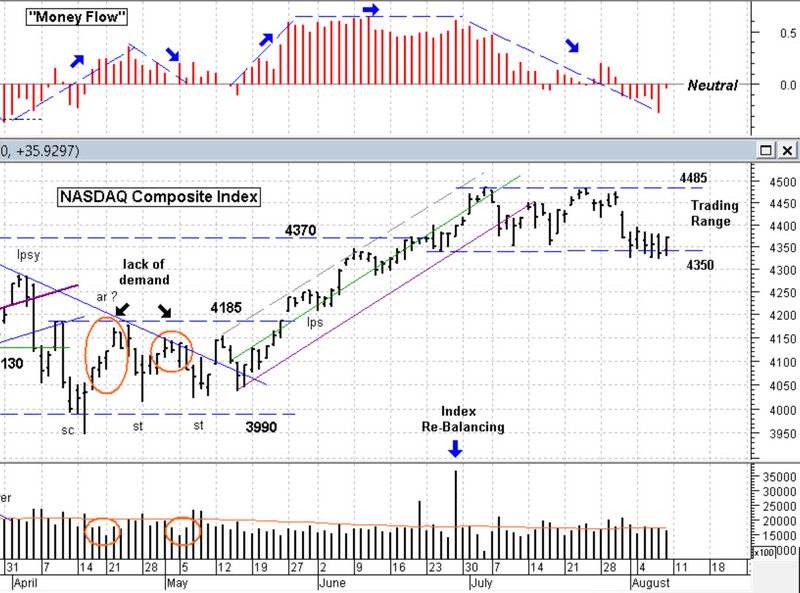 From the chart below we see the NASDAQ Index hugging the lower price support line are around 4350. Technically it closed just a hair below that level on Thursday. The flag went up to watch for weakness on Friday (today), but the market rallied up. So for now no shorting the market, but boy we’re close to it. 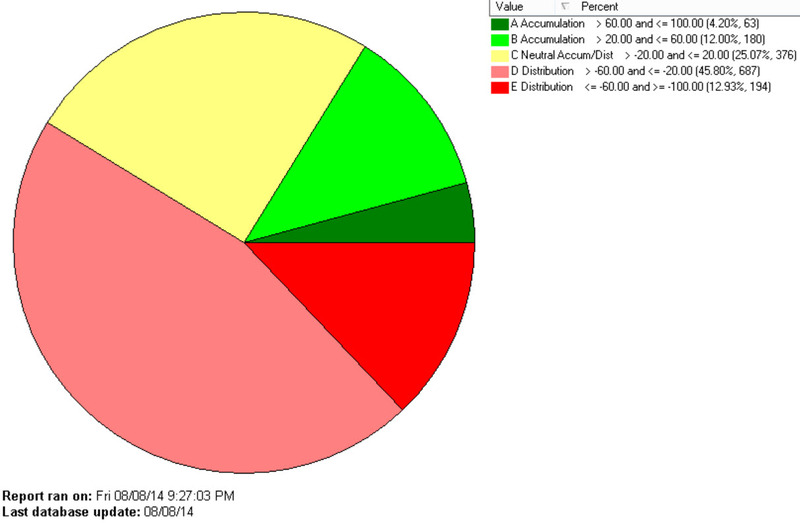 Money Flow (red histogram above the chart) shows money flowing out, but so far not very heavy. BTW, you can click on any graphic to enlarge it for easy viewing. Speaking of selling, let’s look at the amount of Distribution in the broad S&P 1500 stocks (below). A lot of red up there and not much green, so things slowly deteriorated over the past week. This is telling us to be careful, confirming that the market is weak. My market sentiment indicators have been indicating weakness for over 2 weeks now. So what areas are doing well? Note that none of these sectors are what one would label as a market leader. Typically technology, finance or industrials are better bell weathers of a strong market. Only 3 of the top 10 sectors have strong / green rankings in the Accumulation / Distribution column and those areas are pretty defensive. What does this show? Indecision. The bulls are holding on right near that support level trying not to sell, but the weakness is there. I return to my idea that we could just be in for the rest of this summer being in a trading range; and that may be the best that we could hope for. I remain heavy in Cash as my stops have taken me out of positions over the past 2 weeks and I really don’t see many good candidates to even look at. I keep trying but maybe keeping your powder dry is a very good idea here, since the market doesn’t seem to know where to go either. Have a good week and enjoy the summer. There’s not to many weekends left. …………. Tom ………….